For those in the know about the London food scene, it's not all about fish & chips and bangers & mash. Nay, it was actually chicken tikka masala that was declared Britain's national dish. Indian cuisine is oft enjoyed in London town and the Whitechapel area is the place to go. 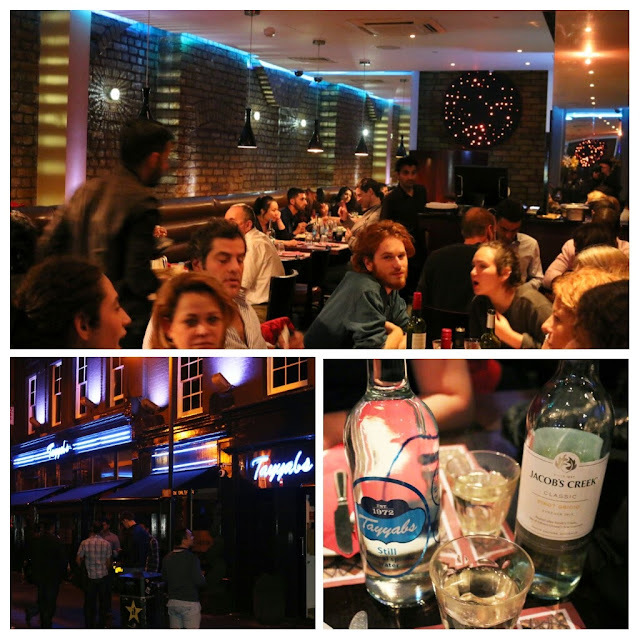 After reaching out to a few local foodies and review sites, Tayyabs was highly recommended and we were not disappointed. The BYOB was bopping with the young crowd, dimly lit, bustling, yet somehow intimate. I appreciated that they brought out their branded water gratis. Perhaps they knew we'd need it for the curries to come. A troika of chutneys were brought out including a spicy red chile with lasting heat, a white cucumber with slight chili heat on the finish, and a sweet, cooling mango chutney to save the day. Some papadum and a puffy rice cracker were on offer, featuring crisp, light textures. A salad of yellow and red onions, cucumbers, tomatoes, and lemon was also brought out. We had to try a samosa, which was filled with savory potatoes and chickpeas, housed in a crisp shell. The lamb chops were definitely a showstopper and well-recommended. It's served smoky to your table thanks to the cast iron grill. In addition to the nicely developed char, the lamb was tender, moist, and delicious. Not at all gamey. The grilled onions added some sweet savoriness to each bite. In preparation for the curry, we ordered some naan, which was the perfect vessel to sop up all the impending goodness. The chana meat curry was wonderfully fragrant and had great depth, with coriander and garlic permeating the roast lamb. The chana dal and the whole chickpeas made each bite even heartier and somewhat (only slightly) tempered the heat of this beast of a dish. The chicken tikka was moist and contained huge pieces of boneless chicken. The onions and potatoes mixed within were plentiful and the base of tomatoes helped to create a sweeter depth than that of the fiery chana meat curry. And as an attempt to soothe the lingering heat, our meal ended with some creamy milk chocolates. So, if you're ever in London, do pop on over to Whitehall and enjoy a proper curry. Tayyabs has got you covered on all fronts. It's also one of the better bargains you'll find.